This etude will get your fingers moving around the fretboard and if you’re used to just playing open chords it will definitely be something new for you to get to grips with. The whole piece is played in 2/4 timing so you only need to count to 2 in each bar. In terms of the timing of the notes it’s quite simple too. We only have to deal with quarter notes and eighth notes throughout the entire piece (crotchets and quavers if you prefer those terms – personally I don’t). Take a look at the performance if you’re struggling to get the timing down. Don’t forget that you can always slow the YouTube player down by clicking on the gear icon and selecting speed (this can be really useful when learning a piece of music). Here’s the tab (to get the 2nd page, just click on the tab or hit the button at the bottom of the page). Also if you need it – here’s my post on how to read tab. I hope you enjoy learning this one, I think it’s a fantastic piece to help players looking to advance (or even those just looking to add to their repertoire). 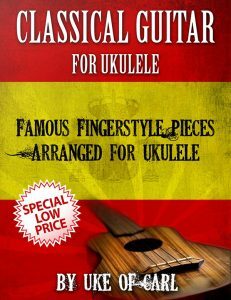 This arrangement was taken from the ebook Classical Guitar For Ukulele which is available to buy for just $10. It includes this plus 8 other classical arrangements from composers such as Carulli and Guilliani. I like your website, I cannot read music yet, if I send you a picture of a song, can you tell me what notes they are and what uke chords they are?